11. Hearty Avocado and Turkey Salad with Greek Dressing (Thrifty Jinxy) – Need a dish for your office carry-in or book club potluck? Consider utilizing this healthy cold lunch idea. It’s hearty and protein packed meaning it’s sure to leave you feeling energized and ready to tackle the rest of your day. Plus, since you serve it in a glass the beautiful colors are on full display and are sure to impress! 12. Grilled Corn and Shrimp Salad (Thrifty Jinxy) – Some of the best cold lunch ideas for work (like this one) allow you to put last night’s leftovers to good use! Use fresh grilled corn on the cob from last night’s barbecue to make this simple, flavor filled salad. Oh, and if you are having a barbecue, you’ll want some awesome sauce, right? Here are the top 10 barbecue sauce recipes on Pinterest! 13. Italian Blue Salad With Apricot Dressing (Trial and Eater) – Honey roasted pecan pieces? Tangy blue cheese? Sweet apricot dressing? This salad is way too decadent to be one of my health cold lunches, right? Wrong! At 480 calories you can still enjoy this salad without feeling guilty. 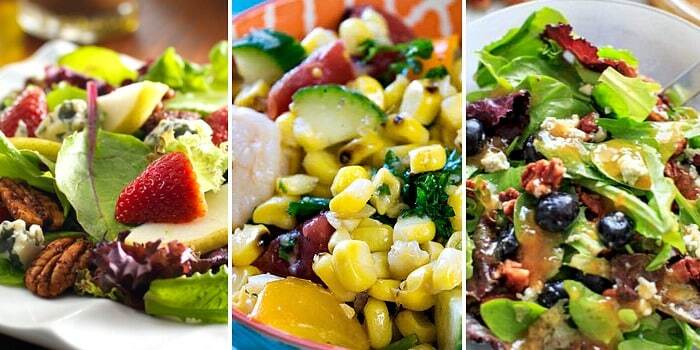 Bonus: Here are 25 more healthy lunch recipes that are almost too good to be true! 14. Veggie Pasta Salad (Midlife Healthy Living) – When it comes to finding cheap healthy meals for college students, complexity (or lack thereof) must be considered. This dish is cheap, healthy, and easy…so it definitely fits the bill. Tip: Make it a day ahead of time so the veggies have plenty of time to soak up the flavor! 15. Cantaloupe Prosciutto Mozzarella Salad (Ann’s Entitled Life) – Okay, now I know at first glance this cold lunch idea sounds pretty strange, but don’t knock it till you try it. (Oh, and trust me, once you try it you won’t want to knock it!) The flavors of fresh cantaloupe, prosciutto, and mozzarella come together perfectly, combining for a taste you won’t soon forget. 16. Chicken and Avocado Salad With Lime and Cilantro (Kalyn’s Kitchen) – This southwestern inspired cold lunch idea for adults is the perfect option when you’re trying to eat healthier. It’s low-carb, gluten-free, and can easily be adapted to be Paleo or Whole 30 friendly. 17. Rainbow Buckwheat Salad (Gluten-Free, Vegan) (Strength & Sunshine) – I love cold lunch recipes that look almost as good as they taste, and this is one of them! The carrots, blueberries, radishes, and herbs (mint and basil) give this dish pops of color that are sure to brighten your day. Just remember: It tastes even better than it looks! Bonus: Looking for more delicious gluten-free lunch options? Look no further! 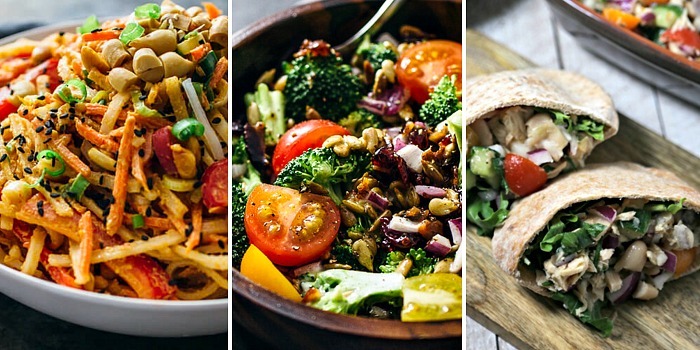 Here are 21 yummy gluten-free lunch ideas! 18. Easy Canned Salmon Salad (Trisha Dishes) – Talk about easy cold lunch ideas! All you need for this recipe is 4 ingredients and about as many minutes. The recipe recommends serving on crackers or toast, but to keep calories (and carbs) down, considering using Romain lettuce leaves or just eating the salad on its own. 19. Cold Peanut Noodle Salad (Savory Tooth) – Missing Chinese and Thai food for lunch? Don’t worry, these cold lunches for work have you covered. This Thai inspired dish is vegan, gluten-free, as flavorful as it is colorful, and sure to save you money over takeout! 21. Easy Tuna and White Bean Salad (Cooking in Stilettos) – This healthy cold lunch idea comes together in just 15 minutes! Serve in a pita pocket or eat it by itself – either way is delicious. 22. Middle Eastern Chickpea Salad (Cooking in Stilettos) – Some of my favorite cold lunch ideas for work allow you to use fresh produce from your garden or local farmer’s market. This is one of them! It’s bursting with fresh flavors that will have you scrapping the bottom of the bowl to get every last drop of dressing! Bonus: Here are some tips to help you save money at farmer’s markets. 23. Dungeness Crab & Sweetpea Zoodle Salad (A Sprinkling of Cayenne) – Okay, this recipe requires a little more prep time (40 minutes) than some of the other healthy cold lunches in this article, but trust me, it’s well worth the effort! I love how this recipe allows you to indulge in crab while still keeping things healthy by using “zoodles” (zucchini noodles) instead of traditional noodles. 25. BLT Egg Salad (Two Healthy Kitchens) – Classic “egg salad” gets a delicious makeover with this cold lunch idea. This is a great option for lunch at work or summer picnics. Plus, it’s ready to dish up in 30 minutes or less! 26. Easy, Healthy Chicken Salad With Quinoa, Tomatoes, Lemon and Basil (Two Healthy Kitchens) – Okay, sure, chicken salad is a great protein-packed cold lunch idea for adults, but it can get boring…. (Or is that just me?) Anyway, this recipe allows you to keep chicken salad fresh by adding in awesome flavors like basil, garlic, and lemon! Bonus: Never suffer through a boring brown bag meal again! Here are 13 more healthy brown bag lunch ideas.